Journalist Ann Curry said she was not surprised by allegations of sexual misconduct against her former "Today" show co-anchor Matt Lauer. A "climate of verbal harassment” existed when she was at the helm of NBC's morning news show, she said. Curry, appearing on "CBS This Morning" Wednesday in her first televised interview since the seven-time Emmy winner signed off "Today" five years ago, said the national reckoning on sexual misconduct by powerful men that has resulted in the firings of Lauer and CBS' Charlie Rose has been "long overdue." She said that she doesn't know a "single woman" who has not endured some form of sexual harassment. "We clearly are waking up to a reality, an injustice that has been occurring for some time," Curry said. "I think it will continue to occur until the glass ceiling is finally broken. This is about power, a power imbalance, where women are not valued as much as men." Do you believe that Matt Lauer abused his power? NBC fired Lauer in November after a colleague's complaint of inappropriate sexual behavior. Other women have since come forward with other alleged incidents of sexual misconduct. Asked whether Lauer abused his power, Curry said she was sensitive to the experience of public humiliation and was trying to "do no harm." But she said, "I can tell you that I am not surprised by the allegations." "I would be surprised if many women did not understand that there was a climate of verbal harassment that existed," Curry said. "I think it would be surprising if someone said that they didn't see that -- it was verbal sexual harassment." Such harassment was pervasive, she added. She did not detail examples. NBC News declined comment on Curry's comments. 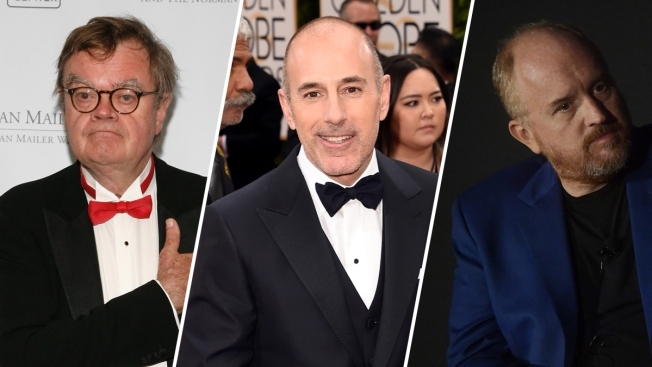 The network has previously said that "current NBC News management was never made aware of any complaints about Matt Lauer's conduct" before hearing from the woman whose account on Nov. 27 resulted in Lauer's termination later that week. Curry said Wednesday that leaving the “Today” show "hurt like hell" at the time but she has since moved on. "For all of you who saw me as a groundbreaker, I'm sorry I couldn't carry the ball over the finish line. But man, I did try," Curry said in her tearful goodbye on June 28, 2012. Curry declined to speculate on past reports over whether Lauer pressed for her exit, saying that question is for "someone else." "It's been years and I want to really move on from this," Curry said. She said the decision to have two female anchors at the helm of the "Today" show with Hoda Kotb's promotion has been overdue because women "overwhelmingly" make up the audience on morning television shows. Curry is now promoting "We’ll Meet Again," a six-part documentary series she reported and executive produced for PBS. The show, which explores historic events through the experiences of ordinary people, begins airing on Jan. 23. Meanwhile, NBC News announced Wednesday that it had promoted Libby Leist, a senior "Today" producer for the past five years, to become executive producer of the show's 7 a.m. and 8 a.m hours. She started as a desk assistant with the network in Washington, D.C., in 2001. She "brings tremendous talent and experience to this role," NBC News chairman Andy Lack said in a note to staff. Longtime executive producer Don Nash is leaving "Today" after nearly 30 years working on the program. He said in a memo he was stepping down to spend more time with his family. Leadership changes are not uncommon when anchors change at shows, The Associated Press reported. Nash has been offered "a number of roles within NBC News and NBCUniversal, and we hope he’ll stay in the family," Lack said in his announcement. With the latest personnel move, three of the executives in charge of "Today" are now women, the AP reported. Jackie Levin is executive producer of "Megyn Kelly Today" at 9 a.m. and Tammy Filler is executive producer of the 10 a.m. hour. NBC News President Noah Oppenheim has overall oversight of the show.